FlamenConAlma takes a tour of different styles of Flamenco Art in which each and every one of the artists will rescue their deepest emotions and through their singing, touch and dance will transform them into a feeling and pure passion that will not leave any of the audience impassive . According to the suit played at each moment, the spectator will experience a great accumulation of emotions: happiness and joy, sadness, tenderness, excitement, even crying. With artists of recognized prestige! 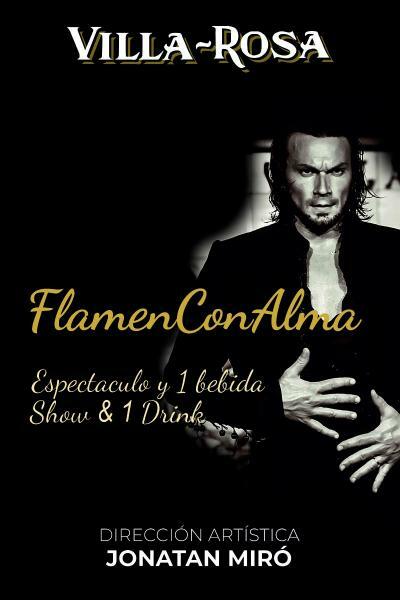 Your ticket includes flamenco show and 1 drink. FLAMENCO GLAMOUR MÖET CHANDON: PVP 140 € for each 2 people. This ticket includes 2 admission tickets for flamenco show + 1 Botthe of Möet Chandom Brut Nature + Fresh Strawberries with Cholcolate.